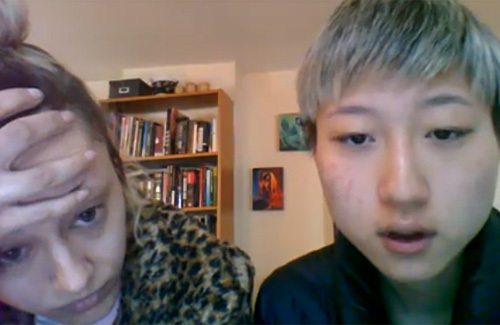 Etta Ng (吳卓林) and girlfriend, Internet personality Andi Autumn, have been homeless in Canada for one month. They found themselves nowhere to turn because of “homophobic parents”. Unwilling to stay at a homeless shelter because the lesbian lovers would be split up, Etta and Andi felt desperate and uploaded a YouTube video crying out for help. Disregarding her mother Elaine Ng‘s (吳綺莉) disapproval, 18-year-old Etta has been dating her tutor, 30-year-old Andi since last year. Etta and Andi left for Canada without notifying Elaine, who panicked and called the police after not hearing from her daughter for five months. Initially, the lovers stayed at Andi’s friend’s house. After they outstayed their welcome, and without Andi’s family and friends willing to help them, the lovers found themselves homeless. Unwilling to go to a homeless shelter because she would be separated from Andi, Etta said, “We’ve gone to the police, the hospital, food banks, LGBT community, shelters, and all of them just don’t give a sh*t. So that’s why we’re making this video. We don’t know what to do at this point.” Expressing anger that two people in love have to be separated, Etta and Andi urged people to re-post and share the video online so they can find help soon. i don’t understand why they did this. they are continually hurting the ones that love them. they may think that b/c that they are crying for help, that they are young and in love means that they can whatever they want b/c others pity them. society is shunning them b/c they are lesbian lovers?! i don’t buy that. i am sorry, kiddo, life is just too cruel for you love birds. either you wake up and try to make something out of your lives or just continue to live in your dream reality. i don’t know much about homeless shelters or good-will charities, but i don’t think they’d split them up esp that they are both girls. young, in love, lesbian may be great, but you got to eat, got to find shelter, got to live before other things. even if they get split up in shelters, so gather yourselves, find a job, make a living, then a love nest. i think this video just showcases what twisted realities these two think they live in. @m0m0 well said, a hundred thumbs up. Andi is really such a bad influence to Etta. They should go find jobs instead of making a video looking for free handouts. I think both of them are just looking for a place to stay since they’re homeless right now. I hate to undervalue their call for help. If they are homeless and are needing a place to stay and time to pick themselves up, then hopefully they are able to reach out to family or friends who can lend a helping hand. That being said, I feel that their relationship is extremely TOXIC. From previous interviews and news reports, it seems that the couple initially stayed with Elaine (unofficially, since I think Andi just visited/stayed over often). Elaine once made a sarcastic comment about how the couple would just sit at home and tell each other “I love you” all day long. Perhaps unhappy with Elaine urging them to get their acts together and get a job, they ended up moving out. Even then, there were reports that Elaine was still financially supporting Etta’s living expenses (reportedly $900 HKD per week). Elaine then made a comment about not having to worry about grandchildren, because she wouldn’t be able to support Etta’s whole family. A while later though, it seemed that Elaine stopped giving money to Etta, and Etta was forced to find a job (I believe she was a part-time photographer) while Andi did not work. Whatever happened to that? What I sometimes find is that when couples are extremely attached and one works while the other stays at home, the stay-at-home one would complain about the working one not spending enough time with them. Yes, it’s a presumptuous statement, but just a thought. All in all, it just feels like Etta and Andi are attached by the hip, are really not motivated to find jobs and support themselves, and just want to be financially supported. This is a very presumptuous thought, and perhaps their families have given them grief about their orientation/lifestyle choices/etc… but all things aside, it just feels as though they don’t want to exert any effort to conform to societal standards of employment –> earnings –> lifestyle. @huynh “(I believe she was a part-time photographer) while Andi did not work. Whatever happened to that?” Elaine revealed that Etta had quit her job and just disappeared for months, which is why she called the cops. Reading between the lines, it seems that Etta and Andi ran off to Canada because that’s where Andi’s home is after having problems with Elaine. If I were Elaine, I would be upset at Andi too…30 years old and still acting like a kid? While also encouraging Etta to leave her mother, when knowing that Etta needs counseling to get her life together. If they really wanted to, Etta and Andi can get jobs as cashiers or waitresses to support themselves. But Elaine seemed to hint that Etta didn’t want to work for little pay (maybe that was the reason she quit her job in Hong Kong). Although Elaine is upset at Etta, it’s a matter of time before she takes her back. I don’t think she will disown Etta and allow her to be homeless for too long. Just had to make an account for this. They should either be in Vancouver or Toronto; which are ones of the two heavily populated cities in Canada. The LGBT community is large and very acceptable. The homeless shelters are also very acceptable. There is no way that the shelters and communities would turn them away. They would not separate two people. This relationship is very toxic. Andi is a horrible influence to the vulnerable Etta. Her short minutes of fame for dating Jackie Chan’s secret child has fizzed out and its hard to believe that Etta would think of running off to Canada without her coaching. I feel bad for Elaine in all of this as she is at her wits end on how to handle her daughter and make a living to support them both. She may have been stupid in putting all her hopes into Jackie but no mother needs to go through this. I do feel that with this exposure, hopefully the whole world will pick up on this and Jackie would face a lot of backlash that would pressure him to face it rather than ignoring. @pinky “She may have been stupid in putting all her hopes into Jackie but no mother needs to go through this.” I don’t think Elaine ever put any hopes into Jackie when she decided to have Etta. It was almost as if Elaine did it to spite Jackie, to unveil his mask as a “good husband”. Having Etta was an impulsive decision on Elaine’s part; I don’t think she really expected Jackie to pay her money at the time. Neither did Elaine forsee all the problems ahead in raising her daughter as a single mother. Last year, when she lost her job and was having so many problems with Etta (I’m sure Etta’s counseling bills are not cheap), Elaine finally put aside her pride and asked Jackie for financial help. I agree that this probably won’t change things with Jackie in that he is still not going to help Etta due to how much he hates Elaine….but at least this will bring more awareness to Westerners so they can see what a horrible person they are worshipping (though of course for some, it probably won’t matter anyway)…. LOL more drama. I sm sure the next thing they will do is to sue Jacky for paternity cost snd claim his millions. This show is like tv drama. Homeless suffering poor daughter lknging for her hearless fathet who abandoned her and mother at birth. I think they should make a movie out of this. I wonder the ending? Maybe dad will repent and get down on his knees and cry for forgiveness. Used to feel.some sympathy for daughter but not now. @mangotango I know right, all the colorful languages of a loser calling for help video? haha LOL… Get a job people!! I don’t believe what they said because I volunteer at several homeless shelters in B.C. They do not separate lovers for being gays or lesbians…. they welcome anyone that needs help. i don’t feel one bit sorry for Etta in this situation. If she were 8 then yeah, I feel bad she’s homeless because her father isn’t financially supporting her. As an adult there’s really no excuse for her to NOT find a job. If its hard to find a job in HK and not be photographed or hounded by paps, then do it in Canada. She’s no Jackie Chan, people don’t know who she is. Her cry for help and stating she’s Jackie Chan’s daughter is just asking for a handout. I don’t for one second believe she didn’t try to blackmail Jackie Chan before her disappearance. Do I think the pedo aunty is behind all this? Yes, but Etta is an adult and she’s fully responsible for her own actions. Just because the Pedo persuade her to make this ‘cry for help’ video, she has the choice to not do so. She put herself in this situation and its her own fault for doing so. Stop coddling her and framing her as the victim here, she’s far from being a victim in this situation. For those nutters out there that thinks I’m trying to defend Jackie Chan take note, I’m NOT. He’s a POS father that deserves all the hate. But in this situation, its not his fault. Etta is just a naive moron who got manipulated by Andi. Clearly, they think that they can affect Jackie Chan’s reputation and extort money from him. Such idiots. Jackie Chan’s reputation is as good as Trump’s yet the latter still get elected as the President. That means whatever these 2 idiots do is not going to affect Jackie’s reputation since he is a well known womanizer anyway. What’s the point of trying to meet Jackie? She thinks he will give her a hug and share half his wealth with her? If Etta even has the least bit of dignity, she needs to get the f**k away from this Andi woman and build her own life by herself. They are homeless? Where did they shoot this video at? With what? No one cares? Did they ever wonder how worried and heart broken parents are when they runaway from them? What about being an adult and being responsible for your own life? We don’t know for sure what’s going on behind these news but if this couple wants to survive in the real world, they need to stop whining and get a real job. LGBT community or homeless shelters wouldn’t turn them away unless there’s a very good reason.. what do they hope to get from this video? Money? Donation? What about millions of people out there that work so hard trying to make ends meet and probably sacrificing the time with family for family well-being too…this couple is trying to get people to support them for free? @cassiemissy looks like a nice house or apt background as well…BS….not homeless but definitely losers. They need to get a jobs lmao! Leave that Andi and go home and find a job! I am surprised to see even the New Zealand media publishing articles about Etta and Jackie Chan.